OK your starter for ten - it’s a 19in class locomotive , but where is it? What else can you tell us about it? From the condition of the loco this shot was taken in LMS or BR days.19 inch goods only worked on the Southern section as far as I am aware. The bridge buttresses look like GCR design. Given the above it must be in the South Midlands. Does anyone know of a GCR single track bridge crossing the LNW? Hoping my comments provoke some more informed deductions ! The bridge deck looks too shallow and the lattice too small to carry a railway line. I think its a footbridge, but where I have no idea. I am inclined to agree with Mike Williams that the bridge is probably a footbridge and has a Great Central look about it. In the goods engines photographs a 19in goods is shown at Chapel en le Frith; that engine was probably based at Manchester or Stockport - definitely not Southern Division. Besides, I am sure I have seen photographs of these engines on the Chester and Holyhead. So little can be [seen] of anything other than the engine and footbridge that there is nothing to show that the location is LNWR. The LNWR and Great Central worked together around Manchester and so my guess as to location would be there - perhaps Guide Bridge, which was used by many LNWR trains. Stalybridge station was GC but it can't be Stalybridge as there was no footbridge at Stalybridge (though an LNWR signal box spanned the tracks) - passengers crossed the line by a subway. What about the van in the background? The two letters visible look like "L M" (presumably "LMS") or "L N" (either "LNWR" or "LNER"). It doesn't look like an LMS or ex-LNWR van. Does any one recognise the roof lines of the buildings over the firebox and tender. The building behind the firebox has a fairly distinct profile, and the tall chimney might help to reduce the options. This loco has a belpaire firebox and its condition suggests 1940 to 1950 when the last were withdrawn.Its on a local pasenger train; does that give anyone a clue? Can't be sure but it looks suspiciously like the footbridge at CANNING STREET NORTH, Birkenhead docks. I'm surprised no one has risen to the challenge of solving this one.! It's got a LMS fitted boiler, the non descript condition suggests 1940 +, and the last one was withdrawn in 1950. The van in the background seems to bear the letters LMS. After 1940 I am sure I never saw one of this class outside the Southern division main line. I can't recall seeing one north of Crewe or in N. Wales or around Manchester. They may well have been in some of the places I wasn't familiar with but then I never saw one on a passenger train either. Does anyone know where they were used on passenger work during or after the war? When I first started number-snatching there were six 19in 4-6-0s left - 8801/15/24/34/58 and 28786. I saw them all in 1944-50 but at that time my spotting activities didn’t extend south of Crewe South shed. In tattered old ABCs I noted that 8824 and 8834 were shedded at Springs Branch and 8801 at Patricroft – though where I saw them I cannot recall, apart from my first (very surprised!) 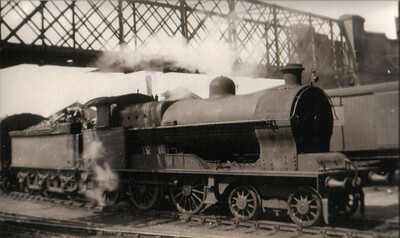 sighting of 8824 at Plodder Lane in 1944. I saw some at Springs Branch shed and possibly others at Edge Hill shed, but don’t remember ever seeing any of them working on trains. From a less-sharp print of this photo it is clear that the letters on the van on the right are in fact ‘LMS’ and that there is a bridge over the tracks to the right. In other words a road(?) overbridge diverged from the footbridge at an angle. Could this be somewhere in the Canning Street, Birkenhead, area? I earlier asserted that this photograph could not have been taken at Stalybridge, on the grounds that there was no footbridge at Stalybridge station. However, about a quarter of a mile west of the station and near the double junction which enabled LNWR trains from Exchange to reach the joint station, there was a footbridge which spanned no fewer than sixteen tracks. From south to north these were: the reception roads for the LNW/GC goods yard and some of the goods sidings; the main lines of the LNWR from Stockport, the GCR from London Road and the L&Y from Victoria; and a couple of the sidings of the L&Y goods yard. So long a footbridge must surely have had some substantial piers, particularly as it changed direction between the GC and L&Y lines. And the buildings at Stalybridge were provided by the GC (as the MS&L), which would account for the style of footbridge. So perhaps this is Stalybridge after all. The cover of this quarter’s GCR Society journal shows a remarkably similary footbridge at Guide Bridge. Harry Jack is correct in saying that the last Experiment Goods engines were located in the north west. Numbers 8787 & 8801 were at Patricroft when withdrawn in November 1948 and 8824 and 8834 were at Springs Branch. Number 8824 was the last withdrawn in 1950. All four were allocated B.R. numbers but were never carried. There were footbridges like the one in the picture at Oldham, between Clegg Street and Glodwick Road - it crossed all the running lines, Guide Bridge, and Chester. I think Alan Budge is correct, in that Stockport Edgeley did have an allocation of 19" goods engines the last ones departing just before I started there on the loco in 1949. Drivers who I fired for told me that in the past 19" goods locos were often used on passenger work, and I am convinced that this photo was taken in the sidings between Oldham Clegg St. and Glodwick Road. We often used to stand there on two coaches waiting for the time to drop down into Clegg St. for a return journey to Stockport. I think that the line via Park Bridge as far as Ashton Oldham Road closed in about 1964. I don't think this can be Oldham (judging from the plan in John Hooper's An Illustrated History of Oldham's Railways (Irwell Press, 1991) because there was another overbridge just to the right of the footbridge. This is visible on a postcard I have which is less sharp than this one, but extends further to the right to include the edge of a more substantial-looking overbridge - a road or a railway - which diverges from the footbridge at an angle: it certainly is not parallel with the footbridge. Baffling! Could the location be Guide Bridge, where there is still a long footbridge? There was a lattice footbridge at Guide Bridge, but a photo in BRILL for February 2010, page 215, reveals that it had a rather different lattice pattern.